It hasn’t been an easy season so far for the Buffalo Sabres and their fans. 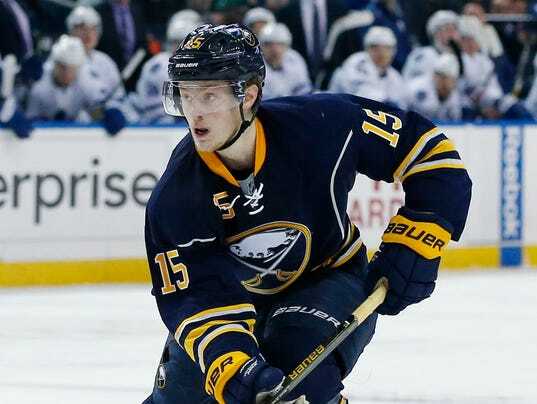 Entering the 2016-17 NHL year with legitimate expectations to perform, fate seemed to stick a thorn in the team’s side when golden goose Jack Eichel sprained his ankle the night before the season opener. Despite not being old enough to drink, Eichel is the anointed savior of the Sabres franchise and is expected to be the man who will bring Buffalo its first Stanley Cup. In other words, the loss was a titanic one for Buffalo. To the Sabres’ credit, the team did pretty well in the phenom’s absence and has managed to stay within postseason contention. Losing Evander Kane to broken ribs half-way through opening night vs. Montreal did not help the team’s problems, but Buffalo is only four points out of playoff spot as of 12/1. But, the team’s offense was lacking in a big way without Eichel, something that was evident night in and night out. Through their first 22 games of the season, Buffalo has scored a woeful 1.95 goals per game, the lowest total in the League. On Tuesday, the Sabres’ patience and perseverance paid off as Eichel finally made his season debut against the Ottawa Senators, and the 20-year-old made his presence known immediately. The Sabres got on the power play early in the first and, seven seconds into the man advantage, Eichel helped set up Kyle Okposo to give the Sabres a 1-0 lead just 6:16 in. Ottawa took another penalty less than two minutes later, and this time Eichel blew a one-timer from the left hash mark past Craig Anderson (who had stopped 120 of 125 entering the game) to give Buffalo a 2-0 lead before the period hit the 10 minute mark. Ottawa proved to be a worthy foe and fought back multiple times courtesy of a Mike Hoffman hatrick, but the Sabres held on to win a wild one 5-4. Besides Eichel, Ryan O’Reilly (2 G+1 A), Kyle Okposo (1 G+ 1 A), Sam Reinhart (1 G+ 1 A) and Rasmus Ristolainen (2 A) had multi-point nights for Buffalo. It was apparent by the start of the game and evident by the end that the Sabres were fired up by the Boston native’s triumphant return, as the team scored five goals for just the second time this season and the first since their second game of the year. “I’m just happy to be back in the swing of things,” Eichel said to NHL.com’s Chris Stevenson. Buffalo has dealt with a plethora of injuries so far this year. Coming into the season with what was thought to be a solid offensive unit, big guns O’Reilly, Okposo, Kane and Zach Bogosian have also spent time as scratches. With their core of talented young forwards finally healthy, the Sabres can start thinking about getting back in the swing of things in the Atlantic Division. Buffalo next plays the New York Rangers at home on Thursday night at 7:00 PM. The long-awaited McDavid/Eichel round 2 is next Tuesday in Buffalo at 7:00 PM, be sure to see it! Entering the 2017-18 NHL season, six teams do not have a player wearing a “C” on his jersey, Arizona, Buffalo, Carolina, Nashville, Toronto and (for obvious reasons) Las Vegas. Though captaincy in the NHL really is just a formality on paper, every team needs a player in that role to be a leader and hold teammates accountable. Though potentially none of these could happen, each of the six teams has a player who is the favorite and should be named captain. The essential Arizona Coyote, Shane Doan, retired yesterday after spending his entire career with them. The last active player who was on the original Winnipeg team, Doan had been the captain of the Desert Dogs since 2003 and was also the longest tenured captain in the League. Losing its franchise cornerstone is a big blow to Arizona, but they have a stalwart more than ready to step up. Oliver Ekman-Larsson is one of the NHL’s top offensive defensemen and has been the Coyotes most potent threat in recent years, even if last season was underwhelming for him. No one else on the team is a viable candidate, but that doesn’t matter because Ekman-Larsson is the overwhelming favorite for the C. With Doan now retired, Arizona is his team. There’s been a lot of contention regarding Eichel’s candidacy to be Buffalo’s captain. He obviously has the talent and the poise, but some fear that he’s too young still, though Edmonton made Connor McDavid its captain this season and he scored 100 points. Buffalo effectively released former captain Brian Gionta this offseason and new Head Coach Phil Housley has not yet named a replacement. Eichel is the face and future of the Sabres and is ready for the responsibility after maturing a great deal during the Sabres’ frustrating past season. If not in Housley’s eyes, Ryan O’Reilly is also an easy choice. The ‘Canes have not had a captain since longtime star Eric Staal was traded to the Rangers at the 2016 Deadline and instead went with four alternates last season, Jordan Staal, Victor Rask, Jeff Skinner and Justin Faulk. Of the four, Faulk is easily the best choice. A rising star in the NHL and very capable two-way defender, Faulk has all the tools to lead Carolina out of the gutter. Still young at only 25, the Hurricanes aren’t going to let their golden goose go anywhere any time soon. Giving him the C is a no-brainer. Like Arizona, Nashville has a vacancy here because Mike Fisher retired after leading the franchise to its first Stanley Cup Final. Not a bad way to go out, especially when you get to go home to Carrie Underwood. 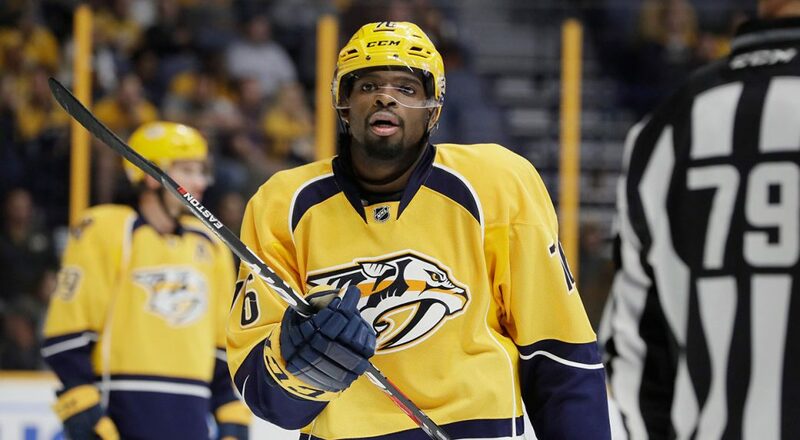 Besides Fish’s excellence, the team’s head-turning run was propelled by the ever-dynamic PK Subban. Say what you want about him, but he’s easily one of the most electric players in the League and would make a great captain. His leadership helped fill a huge void after the team shocked the world with the trade of its former captain, Shea Weber. The Predators have the tools to dominate again, and Subban deserves the captaincy honor. Ryan Ellis and Roman Josi could also do the job. “What stuff are you smokin’, idiot? ?” I’m sure you’re thinking. Yeah I know this one is a bit out of left field, but it makes sense when you think of it (plus I couldn’t be totally predictable with the list). Auston Matthews is fresh off a great rookie season and the Calder Trophy, yes. But there’s still no rush to put the C on the youngster. I know this may also seem hypocritical since I just said that Buffalo should give theirs to Eichel, but it’s just not the same case. Tyler Bozak has been on the Leafs since 2009 and is a seasoned veteran, fresh off a career year. Giving him the captaincy is a smarter move than Matthews because, unlike Eichel, Matthews hasn’t proven he can handle the pressure yet. Bozak as captain will allow the Leafs’ core of young stars that also includes Morgan Reilly, Mitchell Marner and William Nylander to continue to mature. The same could be said for new acquisition Patrick Marleau, but Bozak has been there the longest and deserves it most. The Vegas Golden Knights have not yet named a captain for their inaugural season. Marc Methot seemed to be the easy choice but he was traded to Dallas. Now the Toronto Sun suggested this and it confused me at first, but it actually makes a lot of sense. While Deryk Engelland is relatively unknown in the NHL and an modest, stay-at-home defenseman, he would be a perfect fit for Golden Knights’ captain. Engelland played two years in the ECHL for the Las Vegas Wranglers and Vegas hockey fans know who he is. He’s the closest thing to a homemade player that the team has and fans would instantly recognize him as the team’s captain. There are other choices like Jason Garrison and James Neal, but Engelland is a familiar face to Las Vegas and fans would love him as the leader. Agree/disagree? As always, be sure to take to Twitter to let me know how brilliant or stupid I am. Missing the NHL Playoffs for the sixth-year has an impact on a team. Especially the Buffalo Sabres. The Sabres announced Thursday that they fired both Sabres fired general manager Tim Murray and coach Dan Bylsma. Murray had backed Bylsma returning for a third season as Sabres coach as recently as last week but admitted that the future of both Bylsma and himself rested with team owner Terry Pegula. It’s been rumored that Buffalo’s 20-year-old franchise cornerstone Jack Eichel may not want to sign long term with the Sabres because he is tired of losing. Eichel has one year left on his entry-level contract. The team and Eichel can start negotiating a contract extension on July 1st. The Buffalo Sabres aren’t a bad team, but they aren’t a good team either. Predicted to be a playoff team this season, inconsistent goaltending and (at times) questionable coaching has killed the team’s chances and they seem bound for watching the postseason for the sixth straight year. Despite this, however, 20-year-old Jack Eichel is not struggling at all and is quietly having a phenomenal season. Eichel sprained his ankle the night before Buffalo’s season opener back in October and he missed 21 games as a result. Many were questioning how the injury would effect the young gun, but it’s very clear that it hasn’t. Eichel is scoring at a torrid rate and currently has one less point than games played. He leads the Sabres with 45 points (18+27) despite playing in just 46 games. While it may be very sad that Buffalo’s leading scorer is a guy who missed a fourth of the season, it is also a testament to Eichel’s incredible ability. He is currently 14th in the NHL in points per game with .98, and while that may not seem super impressive, it is when you consider that he trails only the likes of Tyler Seguin and John Tavares. Also, with only half of the season played at this point, that is formidable to say the least, so much so that The Hockey Writers recently called him one of the NHL’s most underrated players. Eichel is also riding an 11 game point streak currently. The Hockey Writers stated that if he played the whole 82 games this season, he would score 80 points. Eichel obviously will not reach that mark, but it is worth noting that he is currently on the same level as his 2015 Draft contemporary, Connor McDavid. McDavid is having an incredible season in Edmonton and will undoubtedly be a finalist for the Hart Trophy, currently leading the NHL with 74 points. However, since Eichel returned on November 29, he and McDavid have the same points total. Had Eichel not missed the first 21 games, he could possibly have just as many as McDavid. Since his return, Jack Eichel has been on the same level as Connor McDavid. From ESPN. There’s many reasons why Eichel doesn’t get the same attention that players like McDavid, Auston Matthews and Patrik Laine get. For one, he’s American (we all know the NHL doesn’t like them) and plays for a small-market American team. If he played for a large market and/or Canadian team, Eichel would be the talk of the League right now. He’s proving more and more that he should not be slept on. The kid who is destined to be an elite threat is on the cusp of becoming one. The fact that the Sabres are playing so poorly yet Eichel is thriving is a testament to how good he is becoming. He has been a bright spot for the Sabres in a frustrating season.